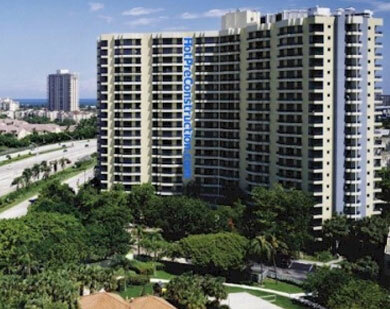 The Aventura condos for sale formerly known as the Bay Club now go by Parc Central, consisting of an eastern and western tower found to the east of Biscayne Boulevard. The Parc Central East tower stands 21 stories tall and has units available with 1,065 to 1,602 square feet of living area while the Parc Central South is a little higher at 28 stories and has 351 units. In between the two Parc Central condos you're going to find a lagoon style swimming pool which is perfect for those summer days in South Florida where the temperatures sometimes call for changing into sunbathing apparel and cooling off with a refreshing dip in the water. Both Parc Central buildings have a fitness center so you won't need to worry about having to walk to the other to make use of all the essential equipment. If you still want to stay active but would rather do so outdoors, there is a volleyball court near Parc Central that you can also make use of. Stainless steel appliances and gorgeous granite countertops only hint at what else you'll find in the residences of Parc Central. You could walk to Founders Park from Parc Central, one of several commons found in the city of Aventura. There is also a three mile fitness trail nearby which complements the various active activities you can enjoy on the Parc Central premises. Also make sure to visit Aventura Mall and check out its many shops. Even if you aren't planning on doing any shopping, the IMAX theater is a great choice to catch the latest Hollywood blockbuster.